Hi all! Just in case you haven’t heard elsewhere, my surrealist poem, “The Healer,” is in this year’s The Spooklet! 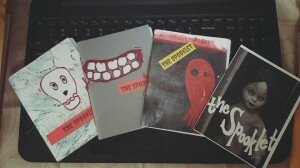 into these awesome, individualized, hand-made editions. So, readers! If you’re interested in getting a copy (or two), each The Spooklet is designed with their own spooky snowflake covers, and they’re going fast! I’m sure you’ll love it. 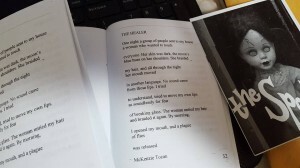 And thank you so much for reading my poem!